Nox Makunga receives funding from the National Research Foundation (NRF), Stellenbosch University's Division of Research Development and the Technology Innovation Agency. Children’s ideas about what their gender means for their intellectual capacity are formed before they have even turned six. One idea that’s particularly pervasive and dangerous is that, only boys are good at maths and science. Popular media only exacerbates the problem. Research has shown that girls hardly ever see adult women doing jobs that involve science, technology, engineering and maths on television programmes. Children’s programmes also rarely feature women doing anything scientific. These early stereotypes may lead to young girls developing a “fear” of these subjects throughout their schooling. This ultimately limits their career aspirations. They become afraid to enter into fields that are based on science, technology, engineering and mathematics (STEM). Statistics compiled by UNESCO reveal that, globally, women make up less than 30% of the people working in STEM careers. The situation is worse in some countries in sub-Saharan Africa. In South Africa, where I live and work, the problem is worsened by the country’s apartheid history. Today, black women are still struggling to access scientific careers at all. Those who do may fall victim to the “leaky pipeline” syndrome: they start degrees in science, but don’t continue to postgraduate level or go on to work in STEM fields. There are many reasons for this, including gender bias. It’s a complex problem. So, how can it be tackled? For starters, there should be a concerted effort to raise girls in a way that encourages them to ignore stereotypical norms. The country’s basic education system also needs massive improvement when it comes to teaching maths and science so that they become attractive subject choices for more pupils. But it will also require funding for bursaries, improved science communication and, linked to this, boosting scientists’ visibility so that young people – and especially girls – realise that they, too, could become scientists. Interventions with just this aim have been successful elsewhere in the world, and there’s no reason they can’t work in Africa too. There have been some positive steps towards getting more young people, particularly women, involved in studying STEM subjects. In recent years, South Africa has unveiled a number of undergraduate and postgraduate programmes to encourage women to enrol for STEM subjects. For example, black women held the largest share of National Research Foundation (NRF) bursary support in 2016 overall. In the areas of engineering and computer sciences, NRF funding was increased more for women though men still get the lion’s share of funding in these important subjects. The funders are trying, but because of the leaky pipeline, among other factors, there aren’t always women to take up these opportunities. So while money is important, it’s not enough. Retention levels are low. 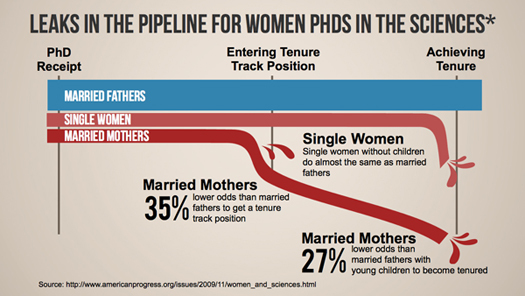 Almost equal numbers of males to females are entering undergraduate science based degrees. At the postgraduate levels, though, the number of men is higher in many science based degrees, suggesting that their female peers have left the system. This isn’t a uniquely South African problem, but what drives it is different – the fact that apartheid, for the most part, kept black people out of universities. As elsewhere, patriarchy is a common global factor in holding girls (and especially black girls) back. In many cultures, women are expected to be subservient to “show respect” for men and the idea that a “woman’s place is in the kitchen” persists. There’s another issue at play: young people in Africa very rarely know any scientists. They don’t see scientists at work, learn about local scientists in school or, often, understand what it is that scientists do. The role of scientists is still a mystery to many even though there have been a number of great initiatives, both global and regional, to improve science communication and engagement. To fix this problem more science communication and public engagement of society in science is needed. All media, whether it’s print, radio, television or social platforms, should be geared towards breaking stereotypes linked to science and technology. With clever campaigns, girls will realise that they can become scientists and work in technology and innovation environments – and thrive. The lack of role models is often a resounding theme for young women entering STEM careers. STEM-based content, whether it’s on TV fiction series or contained in non-fictional journalistic articles, is urgently needed. This can be developed to reach all South Africans, ideally through the SA Broadcasting Corporation’s radio and TV channels because these have incredible reach and represent all 11 of the country’s official languages. Mentorship is another possible approach. Research has shown just how valuable it is for women in STEM to work with mentors. Doing so increases their access to role models, helps them to acquire and refine career development skills, allows them to set goals more effectively and provides a supportive network. All of this wards off women’s feelings of being isolated and under represented in their STEM fields. A word of caution, though: individuals shouldn’t feel forced into mentorship. It must be a matter of personal choice. If universities offer mandatory mentorship programmes, these might do more harm than good by suggesting that women need more help than men to succeed. Finally, society needs more messages that counter stereotypes. Schools, for instance, could teach pupils about the important contributions made by women scientists, especially those in Africa, in all fields. This would improve the visibility of women in STEM – a good way to start untangling age-old stereotypes so that Africa’s future women in science don’t remain forever hidden.